A new record for the most distant galaxy cluster has been set using NASA’s Chandra X-ray Observatory and other telescopes. This galaxy cluster may have been caught right after birth, a brief, but important stage of evolution never seen before. The galaxy cluster is called CL J1001+0220 (CL J1001 for short) and is located about 11.1 billion light years from Earth. The discovery of this object pushes back the formation time of galaxy clusters – the largest structures in the Universe held together by gravity – by about 700 million years. “This galaxy cluster isn’t just remarkable for its distance, it’s also going through an amazing growth spurt unlike any we’ve ever seen,” said Tao Wang of the French Alternative Energies and Atomic Energy Commission (CEA) who led the study. The core of CL J1001 contains eleven massive galaxies – nine of which are experiencing an impressive baby boom of stars. Specifically, stars are forming in the cluster’s core at a rate that is equivalent to over 3,000 Suns forming per year, a remarkably high value for a galaxy cluster, including those that are almost as distant, and therefore as young, as CL J1001. 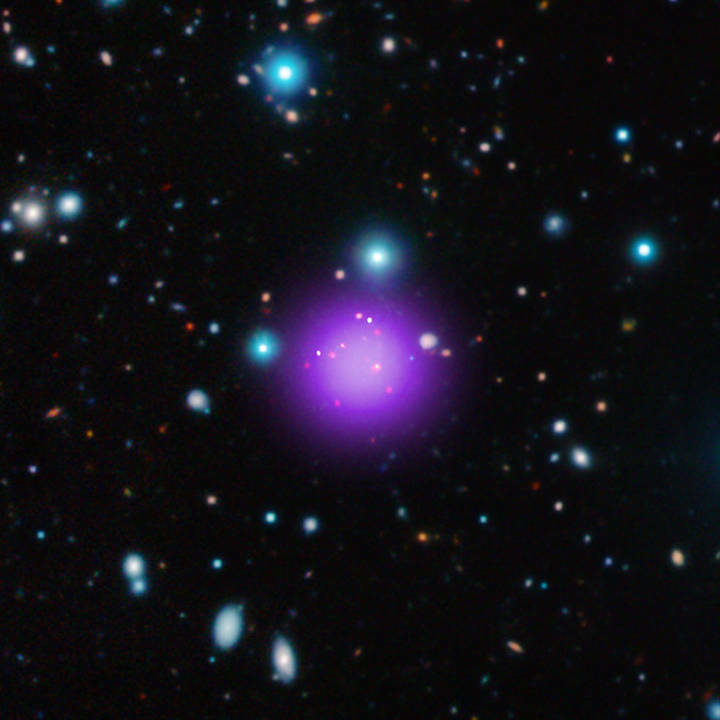 The diffuse X-ray emission detected by Chandra and ESA’s XMM-Newton Observatory comes from a large amount of hot gas, one of the defining features of a true galaxy cluster. “It appears that we have captured this galaxy cluster at a critical stage just as it has shifted from a loose collection of galaxies into a young, but fully formed galaxy cluster,” said co-author David Elbaz from CEA. In comparing their results to computer simulations of the formation of clusters performed by other scientists, the team of astronomers found that CL J1001 has an unexpectedly high amount of mass in stars compared to the cluster’s total mass. This may show that the build-up of stars is more rapid in distant clusters than simulations imply, or it may show that clusters like CL J1001 are so rare that they are not found in today’s largest cosmological simulations. The result is based on data from a large group of observatories in space and on the ground including Chandra, NASA’s Hubble Space Telescope and Spitzer Space Telescope, ESA’s XMM-Newton and Herschel Space Observatory, the NSF’s Karl G. Jansky Very Large Array, the Atacama Large Millimeter/submillimeter Array (ALMA) , the Institut de Radioastronomie Millimetrique Northern Extended Millimeter Array (IRAM NOEMA), and ESO’s Very Large Telescope.